This is a GODSEND. I figured out how to make certain materials disappear with this tutorial. <3 Thank you! Can you do this with textures too? Can you use this to change specific areas of color on a texture (say, only the red on a texture with red, black, and blue), or do you have to edit the texture in some image editor and apply this as a texture change morph? 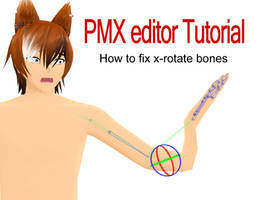 Don't feel bad - PMX models can be hard when you first start. To make parts black, just put "0" in all of the spots that are boxed in color on step 9. Just those spots, because mixing blue, red, and green make black. Wow, now I really feel like a fool for not trying the simplest thing. Would you happen to know if you can make a slider like that, but for different textures? You would have to but that texture on the same part, and and it to the model. Once the part is on, you have to make it invisible. Then, with your sliders, you can make it so the original piece disappears while the second piece appears. OR, if it's a simple texture, you can make it like you would a normal facial, but adjusting the texture instead of the verts. And, under the drop down while making a facial, you have to toggle to the "UV" option. I hope that helps. If not, I can try to explain it better. how do u do that? im looking to add a ghoul eye but have no idea how to do it. u have tutorial for that? Thx. I got it figured. No, that helps a lot! Thank you! You saved my life, I was searching all over the internet for a tutorial about this. Thankyou so much! Thank you!! Really useful for Shiki models! do you know how to make transparency sliders where you can make something invisible/ visible? You can make something invisible by making every single number in all the boxed a "0" instead of a "1"
And yes, the model is a pmx. It was always a pmx. And yes, I did give the slider a category when I made it. In the morphs tab, for panel, I picked "Upper Left (Eye)"
And yes, I named the slider. It's called "Red Eye"
Hmm... from your description, I can't easily tell what the problem is. I would have to see if myself and work with it. You may take my models that can do this and see how I made them. Lika, download This Model -> fav.me/d6n3ri8 and open the "Color Kit" version in the PMD/PMX editor, and study my color facials and do your best to replicate it for you eye. I'm sorry I could not help you off hand. Please have a good day. I eventually figured out what was wrong. It had named it "Null_98" in MMD despite the fact I had given it a name in the PMX editor. It was buried in a list that had a bunch of other null_* values in it. I got desperate and I started trying all of them (they'd been there forever so I normally just ignored them) and to my surprise one of them was it. Do you know how I can make the name show up in MMD? To name it in English, you have to click the second little box next to where you name the facial. It's default set to name the Japanese facial, because that's the language MMD is made to work it, so we have to change the little box to set the facial names into english. Thanks! This helped me get it to accept my name. Now it's showing up in MMD. This is kind of an old tut, but im having an issue all my own. After I make the slider, and save the model, I import the model into MMD, but the sliders don't show. Whats going on? Is your model still a PMX? It must be a PMX model to save the Sliders. Also, if you don't name the slider in English, it will just show up as "Null_##". And, if you don;t designate which category the slider belongs to, then it will default into the "Eyebrow" draw box. Did all that. Still doesn't show up. Wonderful! but how can turn it into black? Make all of the boxes for color "0"
I'm just wondering, how do we do this with textures? You can color textures, too. It should work on any material, as long as it is visible. what the software you use to create this picture ...? do you know how to do something similar but with textures? if you know how can make a tutorial on making PMX Autoluminous sliders? how do you make a Invisible slider? so i make all the boxs 0 (for my model im doing) and it all black~~!!! Like, everybox, haha I should have been more clear. Like, you can click the box that has the "0" in it next to the box with a "1" in it to make them all 0. Really? That's weird. It SHOULD be. Did you index the correct part? If you did, I'm not sure why it's not working. Like, You have to just follow this exactly, except make every box "0" instead of just the color boxes. I don't know what to do. In step 7 the box is smaller than in step 5 but I keep getting the same box as step 5. WHYYY!! You seem skilled with sliders. Do you know how to reverse an already made slider? I'm editing a model and it came with a belt on a slider. It starts as off and I want it to start as on. By off I mean it's really tiny and hidden inside the model. The slider enlarges it. Love sharing your MMD? Join now!